From my pile of forgotten Game Boy carts comes QBillion. You have a top-down view of stacks of boxes. The goal is to reduce these boxes to a single flat layer. 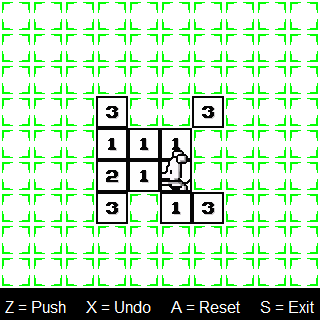 Once you wrap your head around that, it’s intuitive, but the puzzles get downright fiendish. 15 years later, the developer is gone, the copyright has lapsed, and a young developer has made a free HTML5 remake. Source: http://qbillionhd.com and LTD Interactive via Wikipedia and Game Boy World. I saw the screenshots in this Rock Paper Shotgun article and thought it was about this game.